Origin and Habitat: Siccobaccatus estevesii is endemic to Brazil, where it is widespread in southeastern Tocantins, northeastern Goias and northwestern Minas Gerais. Area of occupancy less than 2,000 km2. It occurs in much more than 10 locations, and its distribution is not fragmented. Habitat and Ecology: The species is found on limestone outcrop rocks with dry semi-deciduous forest surrounded by cerrado vegetation. The populations are locally very common and abundant, but declining as it is subject to quarrying of the limestone rocks. They flower at night and have no scent. Insects and birds are attracted for pollination by the white colour. 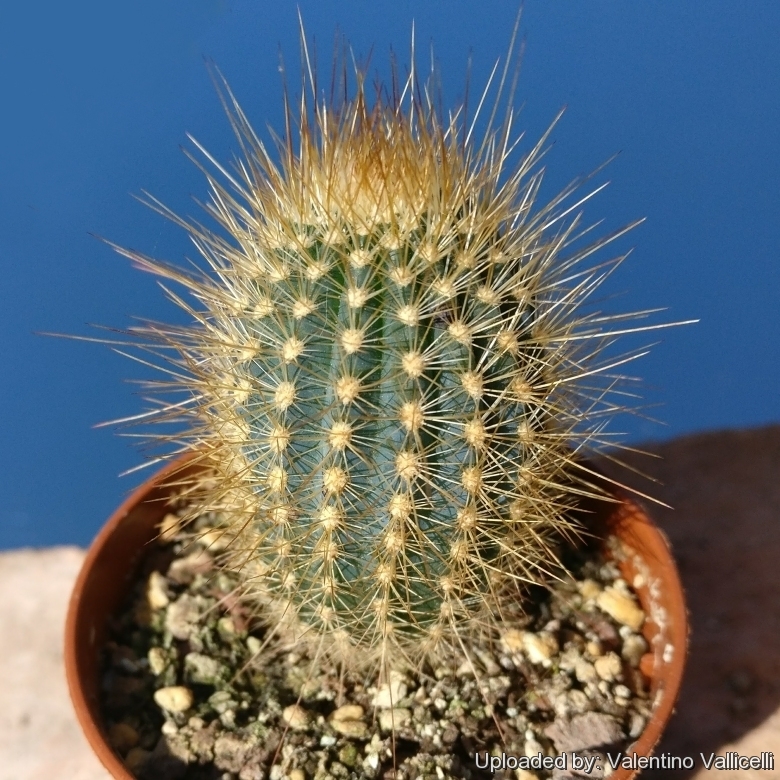 Description: Siccobaccatus estevesii columnar cactus with a striking bluish colour of the epidermis, beautiful spination and the lateral cephalium. It do not branch and reaches several meters. As with most cerei, the flowers are not spectacular. Compared with the general appearance of the plants they are rather modest. Seeds and plants of Siccobaccatus estevesii are sometimes offered under the name Micranthocereus estevesii. Derivation of specific name: This species has been discovered by the Brazilian researcher E. Esteves Pereira and described in his honour by Buining and Brederoo. Stems: Columnar, usually unbranched (or rarely branching), bluish green, up to 6 m high and 15 cm in diameter. Areoles: Round, with yellowish white wool and hairs. Spines: Light brown. Central spines 6-7, slightly bent, 2-35 mm long. Radial spines: About 12, needle-like, 5-11 mm long. Cephalia: Lateral, 5-7 cm wide, with white to cream woolly hairs to 2.2 cm long and red bristles to 0.8 cm long. Flowers: Broad funnelform, white, to 3.5 cm long and in diameter. Fruits: Light blue, dry, to 1.3 cm long and 0.9 cm in diameter. Notes: Two subspecies of Siccobaccatus estevesii are recognized: subsp. estevesii, subsp. grandiflorus from the state of Tocantins and ssp. insigniflorus from southeast Minas Gerais, the latter raised to species level in 2008. 1) Braun, P.J. and Esteves Pereira, E. (1990). "Siccobaccatus P. J. Braun & Esteves gen. nov. Een nieuw cactusgeslacht uit Brazilie". Succulenta 69(1): 11-18. 2) Machado, M. & Braun, P. 2013. "Siccobaccatus estevesii". The IUCN Red List of Threatened Species 2013: e.T152866A688241. http://dx.doi.org/10.2305/IUCN.UK.2013-1.RLTS.T152866A688241.en. Downloaded on 01 November 2017. 3) "Siccobaccatus estevesii" (1975), Cactus and Succulent Journal. Los Angeles 1 47(6): 267. 4) F.Ritter (1979), "Kakteen in Sudamerika: Ergebnisse meiner 20-jahrigen Feldforschung". Volume 1, page 108. 5) Braun, P.J. & Eddie Esteves Pereira. (2001). "Kakteen and andere Sukkulenten in Brasilien". Schumannia 3. 6) Braun, P.J. & Eddie Esteves Pereira. (2008). "Siccobaccatus insigniflorus. A new status for a marvelous columnar cactus from Brazil". Cactus & Succulent Journal (US) 80(436-41. 7) CHARLES, G. (2009). "Micranthocereus, a view from the field of a popular genus of columnar cacti". Cactus & Succulent Journal (US) 81(3):150-155. 8) Taylor, N. & Zappi, D. (2004). "Cacti of Eastern Brazil". Cultivation and Propagation: Siccobaccatus estevesii are seldom cultivated and quite difficult in culture and is preferably grafted, but can more easily be grown on its own roots than Siccobaccatus dolichospermaticus.